Thorium - 90Th Your user agent does not support the HTML5 Audio element. This table shows information about naturally occuring isotopes, their atomic masses, their natural abundances, their nuclear spins, and their magnetic moments. Further data for radioisotopes (radioactive isotopes) of thorium are listed (including any which occur naturally) below. 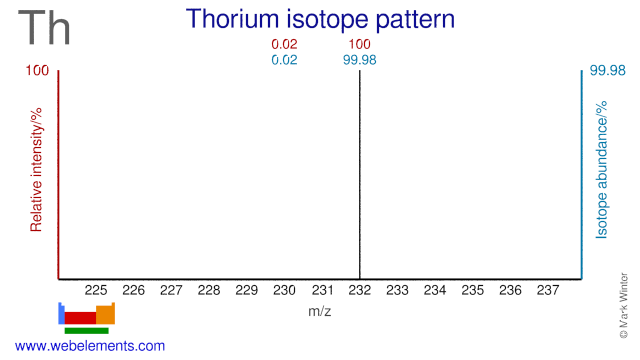 Isotope abundances of thorium. In the above, the most intense ion is set to 100% since this corresponds best to the output from a mass spectrometer. This is not to be confused with the relative percentage isotope abundances which totals 100% for all the naturally occurring isotopes. Further data for naturally occuring isotopes of thorium are listed above. This table gives information about some radiosotopes of thorium, their masses, their half-lives, their modes of decay, their nuclear spins, and their nuclear magnetic moments. R.K. Harris in Encyclopedia of Nuclear Magnetic Resonance, D.M. Granty and R.K. Harris, (eds. ), vol. 5, John Wiley & Sons, Chichester, UK, 1996. I am grateful to Professor Robin Harris (University of Durham, UK) who provided much of the NMR data, which are copyright 1996 IUPAC, adapted from his contribution contained within this reference. J. Mason in Multinuclear NMR, Plenum Press, New York, USA, 1987. Where given, data for certain radioactive nuclei are from this reference. P. Pyykkö, Mol. Phys., 2008, 106, 1965-1974. P. Pyykkö, Mol. Phys., 2001, 99, 1617-1629. P. Pyykkö, Z. Naturforsch., 1992, 47a, 189. I am grateful to Professor Pekka Pyykkö (University of Helsinki, Finland) who provided the nuclear quadrupole moment data in this and the following two references. D.R. Lide, (ed. ), CRC Handbook of Chemistry and Physics 1999-2000 : A Ready-Reference Book of Chemical and Physical Data (CRC Handbook of Chemistry and Physics, CRC Press, Boca Raton, Florida, USA, 79th edition, 1998. P. Pyykkö, personal communication, 1998, 204, 2008, 2010.